Image via DonkeyHotey @ Flickr. House Speaker John Boehner called Senate Majority Leader Harry Reid’s idea for passing immigration reform “Nutso.” Maybe Boehner hasn’t taken a good look at his own party. Then again, who can blame him? 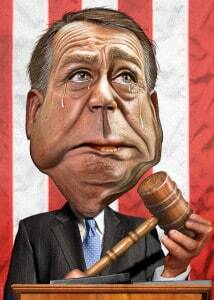 No doubt Boehner was stinging from his latest humiliating defeat. House GOP leadership had to pull their border crisis bill, after conservative media came out against it, and kowtowing to Texas Sen. Ted Cruz and the tea party failed to win enough votes to pass it. Reid tweaked Republicans earlier this week, when he suggested that the Senate could pass immigration reform by tacking it on to whatever the House passed on the border crisis. So it had to hurt when Reid rubbed salt in the wound by teasing the GOP for urging the president to act on his own on the border crisis. Still, if Boehner really wants to see “nutso,” he only need look at his own party — and its base — for the best of the worst in wingnuttery this week. WorldNet Daily columnist Erik Rush wrote that President Obama hates Christians because Malcolm X was probably his real father. Peroukta then held a press conference in which he called the League of the South a “Christian free market group,” and refused to cut ties with the secessionist group. During an interview on the right-wing “WallBuilders Live” radio show, Rep. Michele Bachmann (R, Minnesota) claimed that the Obama administration plans to use undocumented children for medical experiments. Dubbed the “Palin of the South,” Louisiana Republican congressional candidate Lenar Whitney fled an interview after being asked whether President Obama is a US Citizen. Glenn Beck told his audience that President Obama is fueling impeachment talk because “the Black thing is over,” and it may help pass immigration reform. Rep Mike Kelly (R, Pennsylvania) compared EPA regulations to terrorism. Commissioner-elect of Alabama’s Public Service Commission Chip Beeker said that God gave Alabama its coal, so the EPA can’t tell the state not to burn it. “Who has the right to take what God’s given a state?” Beeker asked, during a press conference at which Republican commissioners urged Alabamans to call upon God to stop the EPA.